So, this is my first post on this forum. I'm a 41-year old recreational cyclist living in Belgium, in what we call the "Flemish Ardennes", home to the Tour of Flanders. Two years ago I started cycling frequently, just to keep my weight under control. But after a while, it became my favorite relaxation therapy. After months of torturing myself with a +13kg, 15-years old mountainbike I decide last autumn to buy a bike. Nothing high-end: a CAAD12 105 Disc (MY 2019). I already have some upgrades in mind (saddle, wheels, cranks,...). As always, my bank account will be the determining factor when it comes to transforming those dreams into tangible reality . Welcome to RBR- I'm jealous of all the great cobbles rides you have in your future. 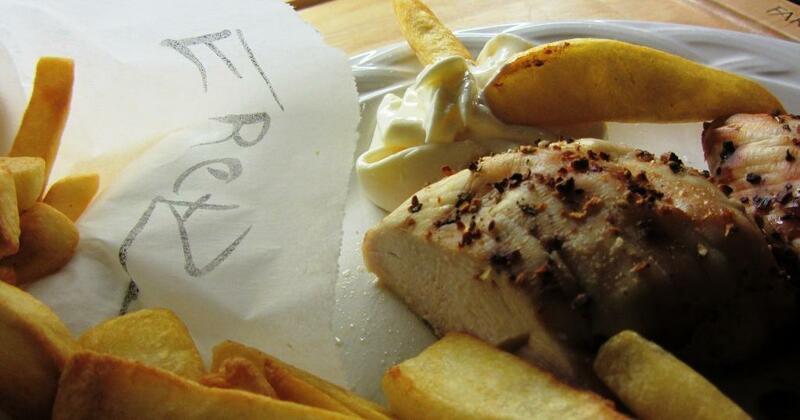 do you really put mayo on your French fries? No, they dip their frites in mayo. It's different. But as an historical note, when I first visted eastern Oregon in 1970, all the drive-ins had tater-tots rather than fries. And they were served with a little paper cup of a mix of ketchup and mayo. Welcome Aboard. Your CAAD12 is certainly a very respectable road bike. Unless these items are causing issues, I suggest that you get some good use out of these before upgrading. And, in Flanders fields, do the poppies still grow? Welcome to RBR! Nice pick, the CAAD series are some of the most popular and most raced frames ever! Great choice! We lived in Belgium, daughters both schooled there [born in france]. I would say that your choice of equipment is perfect. The carbon fibre is great on shock absorption for most terrain. I did a Super Six all over that region without insult to vibration or feedback fatigue. Visit a cycling shop to fit yourself professionally over- [crank length, cockpit [[stem size]], drop on the bars and seat fit]. Those measurements will follow you throughout your endeavours on various choices in bikes in the future. Clothing too. All this, Dat gaat van een leien dakje! You don't need any of us. You're from Belgium. Just step out the front door and smell the air; it SMELLS like cycling. Stand on any street corner and ask the first cycling-crazy Belgian that passes by (there will likely be thousands of them) whatever you need to know. You'll be sure to get an answer, and they'll probably tell you that's what Eddy Merckx did, and that's good enough. They do that ketchup/mayo thing in Utah, too, and call it "fry sauce." Well, I understand the attraction of cobbles but after a few hundred meters of those nasty things I'm always glad to get on a nice stretch of proper asphalt. And on steep slopes like Oude Kwaremont or Koppenberg they're real killers. So it's a bit of a love-hate affair. Yes, in 2018 farmers were encouraged to sow them on their wheat fields, in remembrance of the victims of WWI. * Saddle: removed the standard one and replaced it by the Selle SMP Dynamic from my MTB. Looks weird but it's very comfortable. I'm considering having the Dynamic back on the MTB and going for a SMP Composit. Seems to be bloody hard (no padding...) but after a while you get used to it. Well, that's what Google tells me. I would love to have one for a week or so to test but none of the SMP dealers in the neighbourhood have a Composit available. * Chain rings: I had problems with the chain grinding against the sidewalls of the front derailleur from day one. Went back to the shop, they did some re-alignment and fine-tuning of the FD. After two days the issue was back. When I removed the chain rings for cleaning I noticed that they felt rather flexible. Got fed up with the situation, I've now an 8-arm SpideRing installed. Grinding is gone. When pushing hard I simply feel that the spidering is much stiffer than the original FSA chain rings. Oh yeah: spidering looks much better too (ten arm looks even better so when current rings are worn out I'll be looking for those). * Wheels: I'll probably keep the standard Maddux wheels as my bad weather set, I'm looking for good allround wheels with mild focus on climbing performance. But that's not an urgent item. Mayonaise indeed. But we don't drown them in it . Last edited by Alfa_m; 01-23-2019 at 12:37 PM. Okay, so you know a bit about our crazy little country and its inhabitants! Perfect Dutch by the way. In the past I had some trouble with my MTB position resulting in a Baker cyste on my left knee. As I tried to get my position right I discovered that most bike shops know something about bikes but almost nothing about the human body. So I ended up with a serious bike fitting executed by a physiotherapist/cycling enthusiast. With my new bike I didn't want to have the same problem and chose a shop with knowledge of bikes and human body. The owner is for more than 40 years active in cycling, his son is a physiotherapist and responsible for the shop's bike fitting activities. I had a (limited) bike fitting at purchase, but I have the impression my position isn't perfect. Last week I've installed a shorter stem (1cm), I'll see how that feels. And if I don't get my positioning right I won't wait untill injuries show up , I'll go for that detailed bike fitting indeed. Do TREKs make good Bicycles? You purchased a very good ride and great components. You'll acquire the perfect fit eventually and many personal opinions during the endeavour. Much like my TREK alloyed frame with rear stays and forks in carbon back in the late 2000's. Last edited by Eretz; 01-25-2019 at 03:34 AM. TWell, I understand the attraction of cobbles but after a few hundred meters of those nasty things I'm always glad to get on a nice stretch of proper asphalt. And on steep slopes like Oude Kwaremont or Koppenberg they're real killers. So it's a bit of a love-hate affair. Well said. There's this big push on gravel riding here in the states. I have ridden hundreds of miles of gravel involuntarily (road construction mostly) and really get no joy from the dirt comming off the front wheel into my chain and shoes, slower speed and therefore hotter conditions, etc. I've ridden cobbles in Europe and consider them a novelty to be sampled rarely unless I develop a self-harm mental disorder. Welcome to RBR! And, as previously noted in other replies, I'm deep in the throes of jealousy! Other than the fit recommendation and being comfortable on the CAAD12, I would say the next best upgrade are the wheels and/or tires. As you mentioned, the CAAD12 105 disc comes with the Maddux RD wheelset, and will likely serve you well for a winter wheelset, but I would look at upgrading to something better. 58cm Super Six and super soepel! Did the cat succeed in leaping up on the handlebars? Which gas did you take, regular or premium? Last edited by Fredrico; 01-24-2019 at 04:32 PM. Last edited by Eretz; 01-25-2019 at 03:33 AM. I may have had peanut butter on my hands during the taping of that photo beckoning Sweat Pea to the bars for further examination. First changes will be the saddle, the Prologo Nago causes pain on highly sensitive places. For the time being the SMP Dynamic from my MTB is okay but I have to solve that issue in a proper way. Second on the list are wheels. Will search/start a new topic on this forum in order to gain information and experience. New saddle installed, SMP Composit. Exactly what I need, not uncomfortable at all (have them with crb rails to have some shock absorption, for what it's worth). Impatiently waiting for the courier to deliver a new seatpost. It left the UK based shop Tuesday last week and still hasn't reached its destination, being my front door, grrrrrrrrr . Shouldn't take too long as it has arrived in the Brussels distribution center (well, that's what the track & trace is telling me...). Great going. Did you measure out your seat bone width prior to purchasing? Or did you try out different model seats in real-time? Anyone here do Belgian Waffle Ride?